Father's day is usually all about Dad's, but this one certainly seemed like it was a gift to me instead of my father! 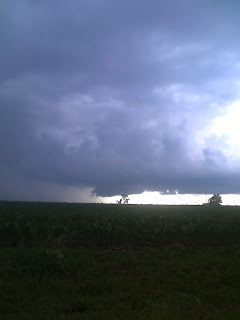 The day started off with a bang as I was awoke early to a small elevated MCS traversing through Illinois that produced a beautiful shelf cloud according to Tavis's pictures. The MCS quickly exited allowing for rapid destabilization from late morning till early afternoon before a large thunderstorm complex quickly blew up right over top of us. This storm produced the largest hail I have seen to date in Illinois! Penny to walnut size hail! 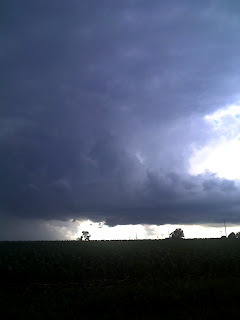 This storm fired and quickly produced a wall cloud type lowering before quickly dissipating...The images were taken with my phone and are not of the best quality...One thing to observe is the northwest flow nature of the storm and the "reflection view" of a typical southwesterly flow supercell. Things quickly settled down after this exciting storm to a normal father's day. We were treated to a beautiful sunset and some hard to photograph hummingbirds! This guy was hard to photograph!